This past week Ken Jennings had a very public failure. After 2700 correct answers, or rather questions, on Jeopardy, he made a big error. Now we all know who has 40,000 workers that work 4 months per year (it is not FedEX, H&R Block is the right answer). So Ken goes home with over $2.5 million. I did some quick math and figured it out that Ken spent approximately 37.5 hours on television for the 75 shows. One standard work week. Not bad. That would work out to an annual income of $131 million dollars if he was able to keep up his hourly rate. However, like all normal human beings he eventually failed. It is said that you learn more in failure than you do in success. As Thomas Eddison said, he had learned 50 ways not to make a light bulb. The 51st try he was able to use his previous “failures” to apply to the final breakthrough solution, one which we all really appreciate. Ken was asked what he was going to take away from this experience and he answered, “during my life, I think I made a lot of safe and practical choices, I never took a chance or did something that for me would be a dream…being on Jeopardy has been that dream. You are much happier when you go for that long shot and play to your strengths instead of always doing the safe easy thing, I am grateful to this experience, if nothing else, for having taught me that”. So what is your dream? What could you do to start moving towards that dream? 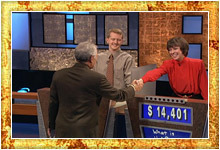 For Ken it was contacting jeopardy to start the process of becoming a contestant. He had to send in a letter and present himself as a credible contestant. I am sure there was much resistance to take this first step. Remember, it would have taken some time before he got on his very first show, but it was significant because it was his first action towards a whole new life. Action-Write down one goal that you haven’t yet reached or even begun reaching for. Write down the first step you need to take towards that goal.